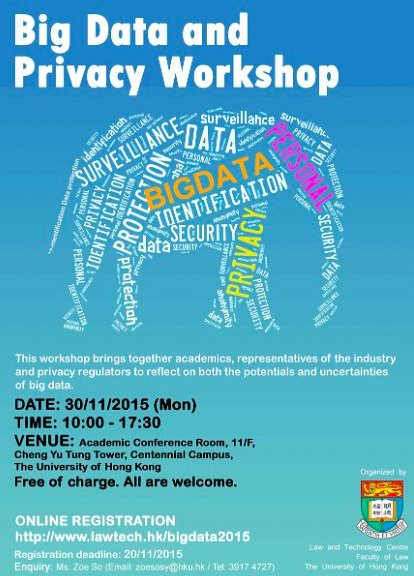 The Law and Technology Centre (the “Centre”) of The University of Hong Kong’s Faculty of Law had the pleasure to host the Workshop: Big Data and Privacy on 30 November 2015. The Workshop was part of a collaborative research project on Big Data and Privacy by Professor Anne SY Cheung of the Centre and Professor Wolfgang Schulz of the University of Hamburg. It was supported by the Germany-Hong Kong (“DAAD”) Research Grant. Revolutionary means of generating and processing voluminous and diverse data sets across different sectors are constantly being developed, with big data increasingly being employed in business, governance and social life. While big data has the potential to add immense social and economic value and serve the common good, it also impacts on the privacy of individuals and challenges the effectiveness of traditional legal frameworks for data protection. As solutions to many of these data privacy issues remain obscure, speakers from the University of Hamburg, Germany, Academic Sinica, Taiwan, and HKU (not only from the Faculty of Law, but also from the Faculty of Social Science, the Departments of Computer Science and Statistics) gathered to discuss these weighty issues. In addition to having input from academics, the Workshop also had speakers from regulatory body, the IT industry and a private law firm, including the Privacy Commissioner’s Office, Microsoft and Winston & Strawn LLP. Speakers reviewed the challenges that Big Data has posed for business, medical and healthcare providers and social movements. Furthermore, it also explored privacy implications and data protection measures in data-driven businesses, including profiling, monitoring and predictive analysis. Rather than providing ready solutions, the workshop aimed to shed light on our understanding of the desirable use of Big Data. Legal developments in Hong Kong, Taiwan, mainland China, Germany and the European Union were discussed... Click here to read the rest of the report published in Hong Kong Lawyer (Jan 2016). The photos from the workshop can be accessed here. With the rise of internet hacking online, it's very important that we know how to keep our privacy safe and protected. Unlike the stories I've read from Writemyessayonline review which are truly disappointing and inaccurate.